Writing an academic essay can seem a complicated task at first sight, yet, devoting some time and efforts, you are sure to succeed in creating a truly efficient piece of work! The aim of this assignment type is to persuade the readers in the writer’s point of view by providing them with firm evidence. 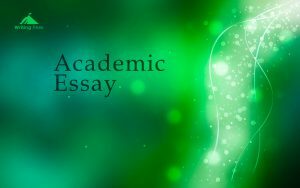 And if you doubt you can perform the work on your own, it’s worth having a look at this brief yet educational article on how to write an academic essay. Get an academic essay example and examine it, too. The academic essay structure is as simple as that of any other essay type. It includes three points: introduction, body, and conclusion. The introduction of the academic essay should reveal your thesis, what research you have made on the subject and what significance your work has. The conclusion, meanwhile, is to briefly summarize the work, and give the final thoughts. It’s important to never bring forward any new idea in the conclusion. The body, in its turn, is to include three sections described below. There is a simple trick to make sure your essay is a thorough work. These are several questions such as “What?”, “How?” and “Why?”. Let’s refer to each of them separately. What do you think, what will your reader think first when hearing your thesis about the phenomenon you stated? What! That’s the question you need to focus on the first right after the introduction. To prove your statement is true, examine well your evidence then demonstrate it in details. Only this way your thesis will appear authentic in your readers’ eyes. Remember that even though this section is perhaps the largest and most of what you have to say should be stated here, the section should never be longer than one-third of the entire work. Otherwise, your work will lose its balance. The second section answering to readers’ all “How” questions comes right after the first section. Readers may be interested in how your thesis can satisfy the counterargument or how the way you look at the evidence you have collected affect your claims, etc. Counting on how long the essay should be, you may have to complicate your argument up to several times. And the last, yet the irreplaceable section of your academic essay writing is the “Why” section. This is the part when you prove that your thesis is significant not only for you. You need to explain what importance the work has in a larger context. And even though you should have already addressed to this point in the introduction, it’s mandatory to refer to it in details here, at the end of the body. Without it, your whole essay will appear insignificant, or even worse, senseless!